Designed to reduce the high cost of repetitive stress injuries.Moving heavy loads is hard on your body. It results in fatigue, back strain and shoulder pain. Plus injuries result in days off work with lost productivity and income, not to mention what it does to delivery schedules. •Full Support Hands-Free Mode carries the whole load for you to reduce back and shoulder strain. Keeps hands free to open doors or sign paperwork. •All Terrain Mode for tight spaces, ramps, stairs or curbs. •Switching modes is a simple lift & forward motion. You can easily switch modes without having to re-stack the cargo. •Made in the USA with high quality American steel, welds and craftsmanship. 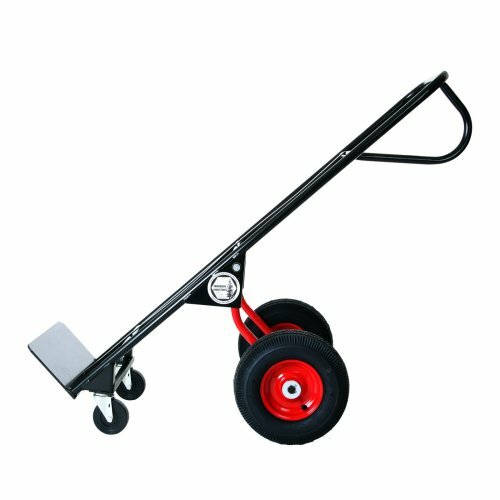 •Oversized 12” wheels make it easier use while on rough surfaces like gravel or asphalt parking lots. Toe Plate: 14" x 8"
This is truly as advertised painless. It makes your load weight free ! My husband & I have truly enjoyed using it. All our children are married & they have enjoyed using our hand truck. We all highly recommend it for everyone. The Painless dolly is the best decession I''ve made. It is a BIG pleasure to usePAINLESS. No weight on my body, a senior citizen. Thanks for a great product. EVERYONE should own one !!! I used the handtruck and it worked well. But I have not really used it to it's full potential yet. Meaning, no heavy items used yet. The Hand Truck handled my #600+ LB. Fort Knox gun safe .It took all the weight off the person and put it on the hand truck . 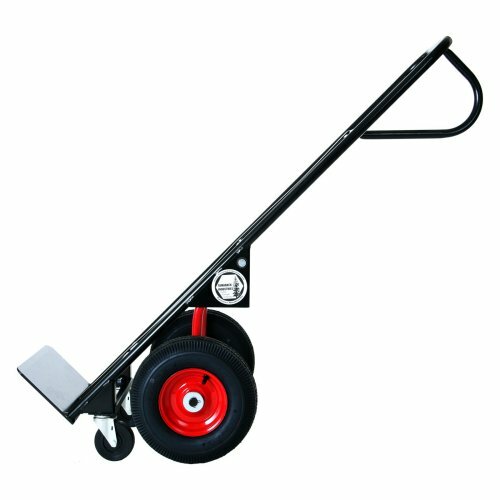 Only thing is the hand truck could use a rear wheel lock to lock in the down position .Great Hand Truck. I returned three hand trucks to the local vendors. Made to thin, not tall enough, bad wheels I am moving 300 to 450 lbs boxes. They failed!!! One case the wheels went flat. This hand truck passed. I did cable tie the large wheels to a fixed position. This way they do not hit me in the shins. 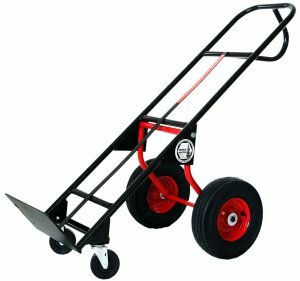 This is a fantastic hand truck. Takes all of the weight off my shoulders. First, I would like to say that I am extremely pleased with this product. 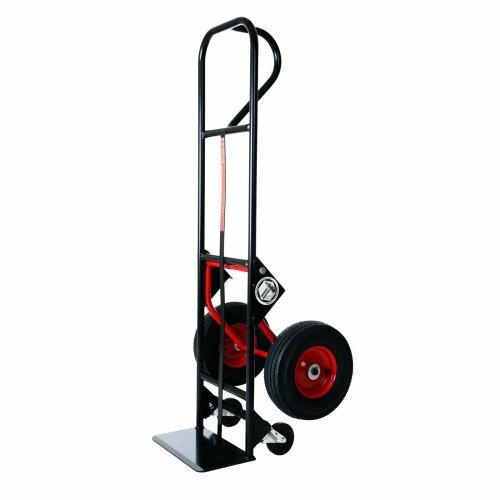 It has helped me move items that no other hand truck could have moved! However, I have discovered one difficulty with it. 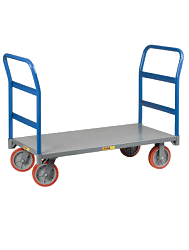 I was moving an object that was over 500lbs, and as I began to tilt the hand truck, the weight of the object went onto the smaller casters, but it also began to roll & and I could not get enough tilt to stop the hand truck from rolling toward me. I had to brace it with a piece of wood until I could stabilize the hand truck on all four wheels. I would not necessarily call this a defect just something I will have to get use to. Otherwise it is a fantastic product better than all others. Would highly recommend!